This tiny speckled bush cricket is only about 1 cm long excluding the antenna. It’s a specimen I found it on a rose bush in my garden, so went to get my gear, knowing it was an opportunity too good to miss. Typically, I rushed back only to find it gone. However, as most macro photographers would in my position, I dedicated myself to tracking it down. After some searching, I eventually found it sitting on some orange poppy leaves. It had been incredibly hard to find as it was a very similar colour to its surroundings. My set-up to shoot this tiny insect was the Canon MP-E 65mm f/2.8 1-5x macro lens attached to a Canon EOS 5D Mark III. My experience with this lens is that there is rarely enough natural light to get a satisfactory shot, so I always employ the use of flash. On small insects, particularly ones that move around a lot (as you can imagine, they rarely stay still), I keep my camera handheld. I have the use of a few bamboo canes and hold them to the side of the lens for added support. It sounds surprising but it’s an easier process than lugging around a cumbersome tripod. The camera was set to manual mode with an aperture of f/14. I’d normally use an aperture of f/9 - f/13 but in this case I decided to push it further to f/14 in an attempt to get that extra bit of depth of field. The lighting was the most important element of the scene. I like to create a natural looking light source in my images and this is usually achieved using a small softbox attached to the off-camera flash unit. The flash was set to manual so I could adjust the output – my starting point is normally ¼ power. I’ve photographed these little crickets before using diffused flash and found that because their skin is a little reflective, you always get that white reflection running down the back. A trick I use is polarisation. I attach polarising film to the front of the flash head using sticky Velcro strips and then place a polarising filter on the lens. It’s a technique called crossed polarisation and manages to cut out the reflections and annoying highlights. In this case, I actually used two flashguns: one screwed to a small extendable pole that I was able to push into the ground and another was placed on a large flower pot next to the poppies. I then used a Canon transmitter on the camera to control the flash guns. Sometimes you really have to plan ahead, think fast, and decide quickly which things to move in the foreground and background. Here, I wanted the cricket against the orange poppy as the colours of both worked well together. I pushed down the front two petals, exposing the stamen inside. I then managed to gently move the tiny cricket with a fine soft paintbrush onto a leaf and place it next to the poppy. Thankfully, it walked into the poppy and onto the stamen without jumping away. I then slowly moved the camera back and forth for the crucial focusing (no focusing ring on the MPE), held my breath and gently pressed the shutter. I think it took maybe three or four shots before it jumped away. After some slight cropping and processing in Lightroom, I got my shot that I had roughly imagined. Sometimes a great deal of dedication and patience really does pay off. At the time I took this image, I was very lucky as I had a large well-established garden in a fairly rural area of the North Devon countryside. Unfortunately, I’ve recently moved and need to start the whole gardening process again with plants, flowers and shrubs that will attract invertebrates and other wildlife. This shot was captured while I was sat one day in the aforementioned old garden. At some point, I noticed a bee sat on a leaf and I began to watch it. I really enjoy studying insects and their habits, and it’s this that has made photographing them easier as it’s given me an insight and understanding of their behaviour. Surprisingly the bee in question didn’t move for what seemed like minutes. I always have my camera gear to hand when outside and carefully went about setting up. I use a Berlabach Mini tripod, which allows you to place the camera very low to the ground. I’ve attached a couple small Sunwayfoto brackets and a Newport Linear Stage to the tripod that lets me move the camera forward in very small increments. That allows me to take several images of subjects and stack them together in a programme called Zerene. I can then process the image in Photoshop. Stacking pictures of small invertebrates produces images with far more depth of field than can achieved by taking just a single shot. Fortunately for me, the solitary bee in this image stayed motionless for the entire time I was photographing it. This isn’t always the case and consequently my failures far exceed my successes. Ecuador is a nature photographer’s utopia. From the Galapagos Islands to the rainforests, photo opportunities are almost endless. Add in the great local people and cultures, and it is easy to see why this is one of my favourite places to visit. 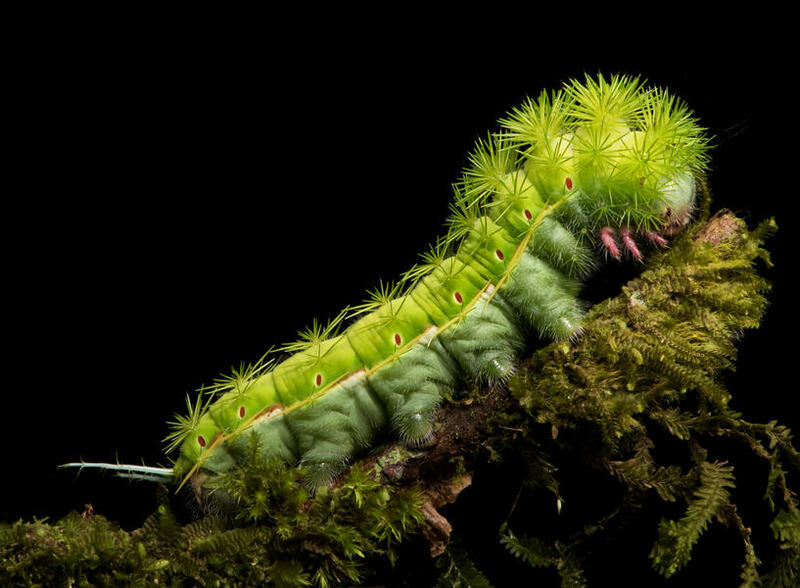 This spiny caterpillar image was captured during a photo trip to Ecuador. The trip was to be split between hummingbirds and macro shots of reptiles and amphibians. We visited four distinct areas of rainforest for the variety of these types of subjects and succeeded in capturing fantastic images of a wide variety of hummingbirds, snakes, frogs, lizards, and flowers from each location. However, it was the insect macro photography that ended up being the most fun. Walking back from a remote parrot photo site in a light rain, I spotted this beautiful caterpillar and immediately stopped to photograph it. Because the spines on this caterpillar can result in painful stings, I decided not to try and move it and instead photographed it in place. The light was low and I was shooting handheld, so I decided to use a single off-camera flash with a small softbox attached. I took the first shot with the flash off and, using manual mode, I underexposed it slightly to get a clean dark background and obscure some of the clutter from the other vegetation in the background. I really did not realize how good the end result was until I was back at camp. From that moment on, no more hummingbirds. It was all macro with an emphasis on spiders, caterpillars, grasshoppers, praying mantis, butterflies and everything in between. In nature, the key to survival is to either hide or appear to be threatening to others. 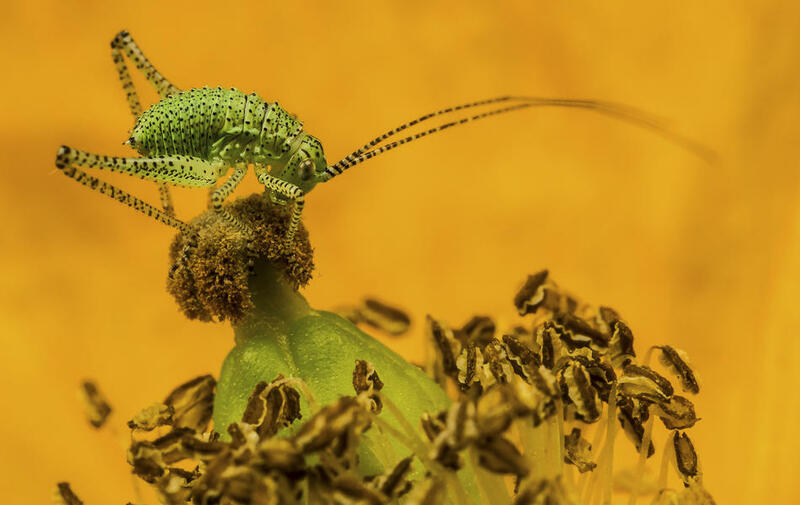 Many great macro subjects blend in very well with their environment. Snakes, frogs, lizards and many insects are fantastic at blending in with their surroundings. Yet others like the spiny caterpillar stand out because of their brilliant colours and the dazzling displays of spines. Basically, the message is ‘Do not touch, I am not safe to eat’. In fact, I did try to reposition a different species of spiny caterpillar at one point and got a rather unpleasant response when I touched it. Yet it is those colours and warning displays that make these subjects attractive to photographers. What’s particularly great about macro is that it is a technique that can bring out the details in everyday subjects. These are subjects that most of us typically ignore because of their small size or just because the subject is so common. Yet macro makes these subjects stand out and become interesting. Another great aspect of macro photography is that you really do not need to travel to Ecuador or similar locations. You can do shots like this in your garden, the park, and anywhere else you can think of. 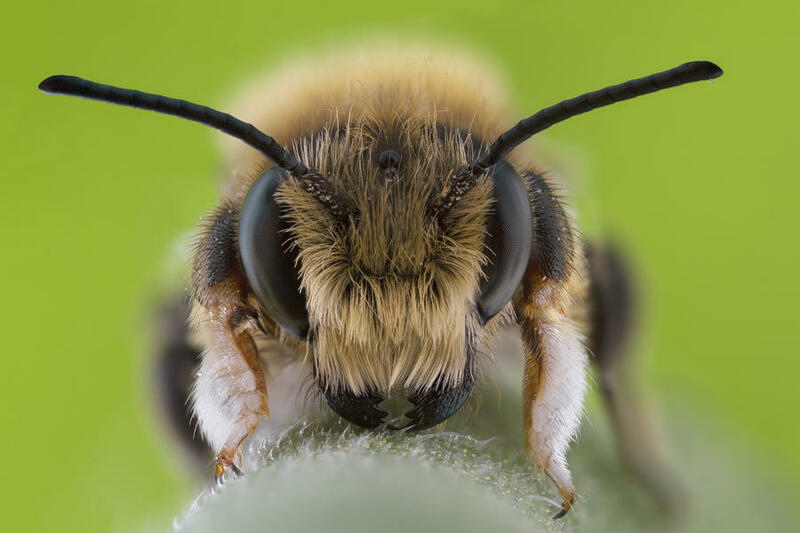 Your subjects can be manmade or natural and you can easily capture them with a simple kit including a macro lens, flash and wireless trigger. If it’s a technique you’d like to develop, I’d recommend practising your macro skills in the comfort of your own home. Set up a small subject in the kitchen, perhaps some sugar cubes or a fork. Experiment with lighting changes, depth of field, shadows and camera settings. Start with a desired ‘look’ in your mind and then try and capture that look. Then when you’re in the field, it will be much easier, faster and safer, particularly if you’re dealing with critters that can bite or sting. Additionally, good macro skills will improve your other areas of photography. It can help you understand lighting, the positioning of the subject, the impact of camera settings and the application of flash or other light sources. In addition, it teaches you to see. How many people would have walked right past that brightly coloured, odd-looking caterpillar in the rush to get out of the rain?